Sometimes putting all the coloring on the inside is just…well, just better, right? Especially when a 2 part pun is the reason why! Check out the crazy little scene in my video today – complete with tips I learned along the way. Watch the video below or click HERE to see it in HD on YouTube. This is actually the outside of the card….so it’s the lead-in to the pun! Your are amazing. So creative and love seeing your creations and hope that it sticks in my head.. Your talent behooves me! Great work as always! What a cute card! I love the idea of putting most of the work inside the card, oftentimes the inside gets neglected on my cards because I don’t know what to do with it. I love watching you color and seeing your vision emerge, and especially hearing your thought process as the card develops. Thank you Sandy! Love this, Sandy! So creative. And that stamp set is adorable. 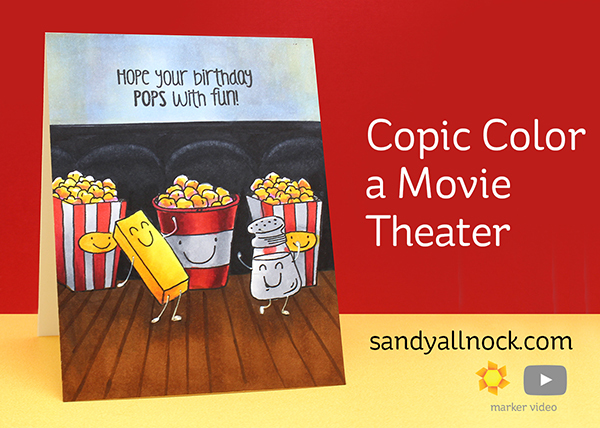 So funny especially the smiling single popcorn..it makes me laughing..
Fun way to start a Monday – great idea to put the main image on the inside – you do have a way of thinking in and outside the box!!! 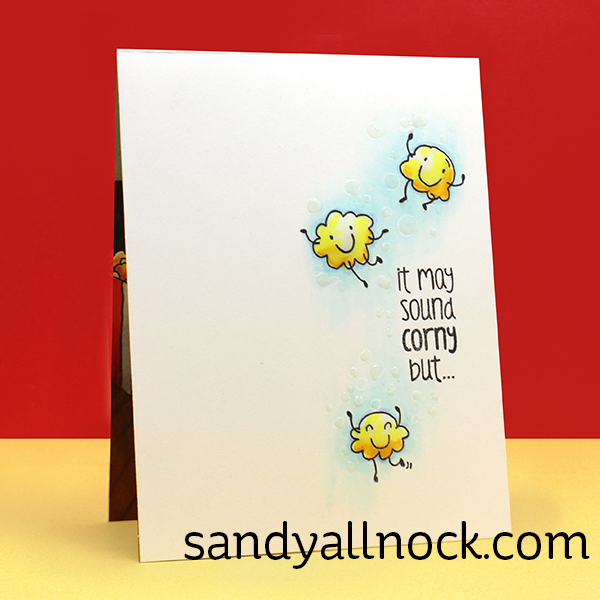 The stamp set from Inky Antics is a great one too – loves me a good pun!